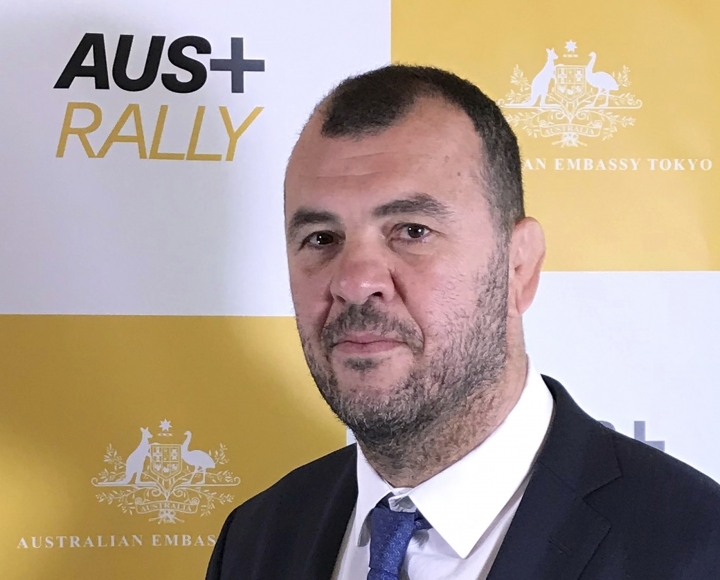 TOKYO — Australia coach Michael Cheika has predicted the Wallabies will rebound from their worst season in six decades to be a force at the Rugby World Cup. Australia lost nine of its 13 test matches in 2018 and its provincial teams under-performed in Super Rugby, but Cheika is growing in confidence six months before the global tournament kicks off in Japan. "We'll be in good shape when we need to be," Cheika told a news conference Wednesday at the Australian Embassy in Tokyo. "Right now, everyone is playing Super Rugby so we're just doing our best to stay on top of everyone with a bit of individual attention to players." The Sept. 20-Nov. 2 World Cup will be the first time the sport's showpiece event will be hosted outside one of rugby's traditional powerbases, and Cheika expects that to have an impact on competing teams. "It's going to be an open World Cup for sure," Cheika said. "Not just because of how the teams have performed leading up to here but also because of here. I think it's going to be a very different atmosphere at the games." Australia, which won World Cup titles 1991 and '99 and was a losing finalist in 2003 and 2015, is in Pool D with Wales, Georgia, Fiji and Uruguay. The top two teams advance to the knockout rounds. Cheika has already had success at the World Cup, taking over as Wallabies head coach in October 2014 after successful coaching stints in Europe and with the New South Wales Waratahs in Australia. His initial months on the job were positive, helping rebuild a team that was in disarray and get them reach the final before losing to archrival New Zealand. So far, that has been the peak. The Wallabies have slumped in the rankings in last two seasons and haven't had a consistent game plan, frustrating fans, players and administrators. It led to assistant coach Stephen Larkham being fired in February amid another overhaul of the coaching staff. Larkham, who made 102 test appearances and was a pivotal player in Australia's World Cup win in '99, couldn't agree with Cheika on attacking strategy or game philosophy in the wake of the national team's worst seasons in 60 years. "It was very difficult, obviously," Cheika said of the decision to part ways with Larkham. "But just looking at some of the changes I think we needed to make on and off the field going into this year to get the best possible outcome in November 2019, sometimes you've got to make those hard decisions. "Have I looked at a replacement yet? No, not as yet. We've got a bit of time, so we'll look and see how Super Rugby pans out and what we need as we start to pick up and we'll make a decision then." Cheika also commented on the recent announcement that Japan's Sunwolves will be leaving Super Rugby after 2020. Super Rugby's governing body announced last month it was cutting the Tokyo-based franchise and reverting to a 14-team, round-robin format for strategic reasons. "Me personally, I'm disappointed," Cheika said. "I just think they played great footy, they played good rugby. They are entertaining and that's what we do, we are here to entertain and give people value."